While the DRA agrees that the problem of leaking or aging toilet facilities should be addressed, we believe that the proposed removal of these facilities, without replacement, is a step in the wrong direction. Some individuals on the DRA Board of Directors, and many of our supporters, have been using the river for over 40 years—a period that saw a change from a few rudimentary outhouses on the river to the current situation of multiple toilets, strategically located to accommodate the river’s heavy traffic. We have witnessed a profound improvement in the river during that time as a result of these toilets. This includes less direct, visible evidence of human waste and toilet paper on the river’s banks, and less resulting harm to water quality and aquatic life. BLM’s proposal to remove 10 of the lower river’s existing 75 outhouses will almost certainly reverse some of these improvements, to the detriment of river users and the river’s aquatic life. We believe that any facilities credibly deemed to be a risk to water quality should be quickly replaced and improved, rather than removed. A principal justification offered for removal of several of these toilets is that the areas are primarily accessed by boat, and users would already be carrying portable toilets. We believe this statement is inaccurate, as most of these sites are also accessed by river users who are not required to carry their own toilets, including hikers, bikers, and day floaters. Further, removing toilets at some lower river sites would undoubtedly lead to overcrowding at other nearby sites with toilet facilities. And the BLM proposal does not address the increased amount of waste that will be transported downstream—and will necessitate disposal—from overnight boaters’ portable toilets. BLM is accepting comments on this proposal until Wednesday, September 5. DRA has submitted comments, which can be read here. Please take the time to submit your own comments to BLM, to request that they re-think this proposal in light of the information above. These toilet facilities are essential to maintaining the ecology and recreation experience on this incredible river. More information about this proposal can be found here. Round Butte Dam and the Selective Water Withdrawal Tower. Photo by Greg McMillan. 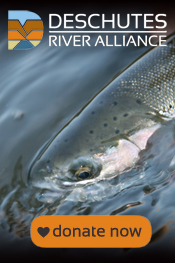 On Friday, August 3, the Deschutes River Alliance was notified by the Federal District Court that Judge Michael Simon had ruled against the DRA in our Clean Water Act citizen suit against Portland General Electric. In recent months DRA and PGE had each filed motions for “summary judgment,” asking the Court to determine whether PGE was violating the Clean Water Act at the Pelton Round Butte Hydroelectric Project. The Court granted PGE’s motion—a decision which, if it were to stand, would result in dismissal of the case. We are in the process of analyzing the Court’s ruling and assessing our next steps as we work to ensure that critical water quality standards are protected on the Deschutes River. While we are disappointed in this decision, it is not the end of the fight. We will continue pushing forward to protect and restore this incredible river, using every tool available. We won’t let up until cooler, cleaner water returns to the lower Deschutes. Be on the lookout soon for the next steps in this important fight. Cooler, cleaner H2O for the Deschutes!